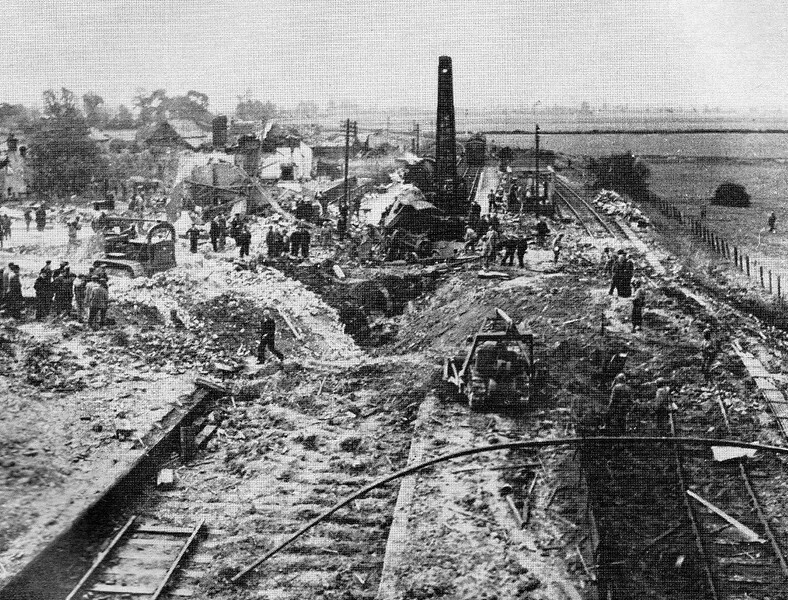 The scene at Soham on 2nd June 1944 when the front wagon of a Whitemoor to White Colne ammunition train containing forty, five hundred pound bombs caught fire and exploded in the station area. Both the driver, Benjamin Gimbert and fireman, James Nightall received the George Cross and LNER medal for their bravery in detaching the wagon and moving it away from the residential area of Soham. The station was destroyed and seven hundred houses damaged, but the town escaped devastation. Regretably, during the incident Fireman Nightall and the on duty signalman, Frank Bridges, were killed, and the driver badly injured. The view is facing Fordham. Image source. The Cambridgeshire Collection. Information source. A Regional History Of The Railways Of Great Britain Vol 5. D.I. Gordon. The locomotive involved in the Soham explosion was W.D. 2-6-0 No 7337, a locomotive which later became known as Army No-400 "Sir Guy Williams" At Soham, the extensive damage caused by the exploding wagon included a massive crater and the destruction of the signal box. Despite this , the line reopened later the same day and the remaining wagons of the train involved eventually completed their journey. The wagon which never arrived at White Colne or rather what was left of it, remains to this day buried in the bottom of the former crater and undisturbed by today's trains passing a few metres above.